Production Management is the core of business farming operations. Spreadsheets are an inexpensive and widely used production management solution. However, as experienced users know, spreadsheets are literally “Islands of automation”. It can be a challenge to maintain precision when attempting to track equipment, fertilizer and other resource needs. And difficult to do while matching it with the specific type of products and yields you’re trying to grow. Consequently, using a spreadsheet model designed for resource planning to manage your product growing schedules is complicated. At best this typically means that you will be maintaining multiple spreadsheets. The practice of maintaining multiple spreadsheets can lead to double entry of status data and corruption of cell relationships. These are common problems that increase complexity and stress and consume valuable time. Clipboards and notepads are also important tools. This is because spreadsheets are typically available only on a single computer. But, over time, the spreadsheet simulation deviates from the actual growing plan. And then there is a growing risk that poor information will result in lost production, missed delivery dates and loss of profit. Over reliance on clipboards and a paper-based system, use of multiple spreadsheet are all too common and frustrating occurrences on many farms these days. Farm Production Manager for the Business Minded Farmer solves problems with scheduling tools, integration and connectivity that far surpass the capabilities of ordinary spreadsheets. Farmers can view schedules, enter feedback data or correct inputs from anywhere, home or field at any time. Simply selecting a growing template, Select your Milestone date and Milestone quantity. The rest is calculated for you! 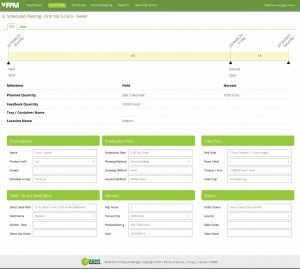 All the formulas are built in and will automatically calculate requirements for seed, trays, bed space and any other dependent resource used to grow your products. 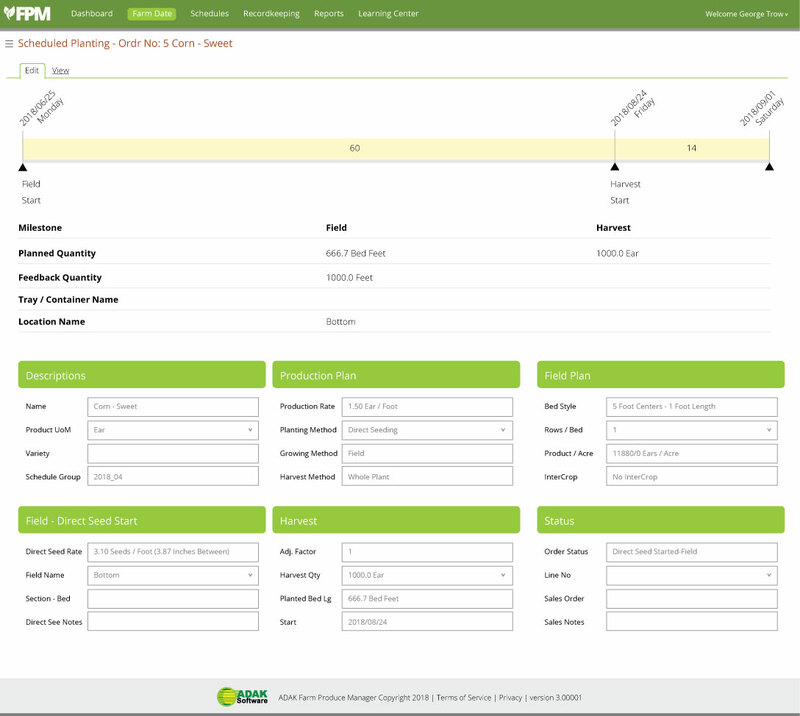 Farm Production Manager has user friendly screens that allow you to quickly create production schedules. This includes single schedules, succession schedules, copy and split schedules. Farm Production Manager has great tools to distribute your schedules in print, email or in real-time on your smartphone or tablet. A collection of User customizable task lists are provided for Tray Starts, Plug Field Starts, Direct Seed Starts, Harvest Starts, plus User Maintained resource requirements lists. Farm Production Manager also provides Recordkeeping screens and a mobile app that let you enter real-time feedback recording progress and changes in the plan and production notes. This automated feedback is used to update a central status indicator for each schedule and is visible to any User of the system.